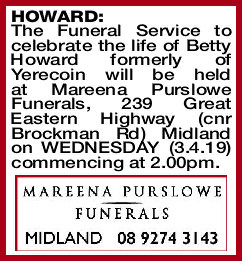 The Funeral Service to celebrate the life of Betty Howard formerly of Yerecoin will be held at Mareena Purslowe Funerals, 239 Great Eastern Highway (cnr Brockman Rd) Midland on WEDNESDAY (3.4.19) commencing at 2.00pm. her family dearly. 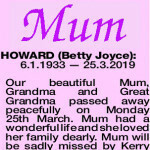 Mum will be sadly missed by Kerry and David, Ray and Pat, Geoff and Sue, Wes and Joeley, 9 grandchildren and 8 great grandies. Now reunited with Dad. Always in our hearts. Our most sincere and heartfelt thanks to Dr Varghese and all of the wonderful people at Hermitage Ellenbrook who have always cared for Mum with so much compassion and kindness. 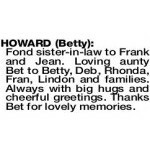 Fond sister-in-law to Frank and Jean. 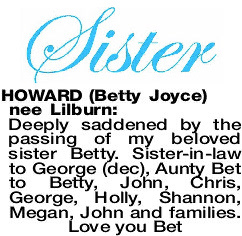 Loving aunty Bet to Betty, Deb, Rhonda, Fran, Lindon and families. Always with big hugs and cheerful greetings. Thanks Bet for lovely memories. 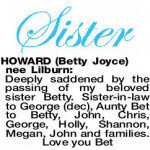 HOWARD BETTY Much loved Aunty to the Harland clan. Cherished memories of many happy times together. Sympathy to Kerry, Ray, Geoff, Wes and families. Deepest sympathy to all the families. 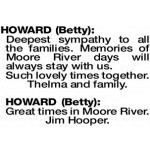 Memories of Moore River days will always stay with us. Great times in Moore River. Jim Hooper. 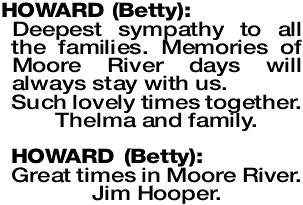 HOWARD BETTY In our lives we have a small bunch of people we love the most. 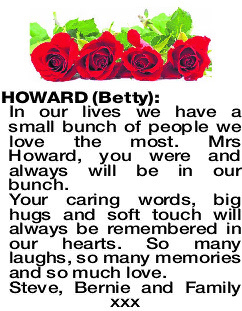 Mrs Howard, you were and always will be in our bunch. Your caring words, big hugs and soft touch will always be remembered in our hearts. So many laughs, so many memories and so much love.